In the heart of San Diego, Balboa Park contains museums, art galleries, the San Diego Zoo, theaters, an artists' colony, and many sports facilities. 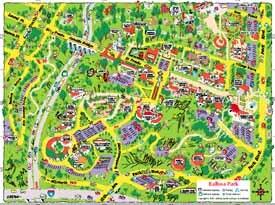 This map of Balboa Park shows the most popular area of the park. For links to the Web pages of the many museums and attractions of Balboa park, click here. Size: approximately 12" x 9"
Check out my Balboa Park walking tours.